Editor's note: This is the second of a three-part series that introduces The Texas Coastal Exchange (TCX), a trading clearinghouse involving the sale of ecological services. Click here to read part three of the series. One of the key markets the Rice University's SSPEED Center team has identified as a target is the purchase of carbon dioxide storage rights. Carbon dioxide is a naturally occurring substance that is emitted by natural decomposition as well as by fossil fuel combustion. In nature, there is a so-called carbon cycle. In this cycle, carbon dioxide in the atmosphere is transformed by photosynthesis in plants into carbohydrates such as cellulose and sugars. Some of this carbon becomes biomass (such as trees and plants and other carbon goes into the root system as root mass or to microbes that feed upon sugars released by the root system). Over time, some of this carbon biomass is decomposed and transformed back into carbon dioxide gas that moves back into the atmosphere, thereby completing the carbon cycle. Today, our carbon cycle is out of balance. We are emitting more carbon dioxide from fossil fuel combustion than is being removed from the atmosphere by photosynthesis and by other natural sinks such as the oceans. This carbon dioxide is building up over time in our atmosphere and is contributing to the so-called “greenhouse effect,” which is a process of heating of the Earth’s atmosphere that is similar to the heating that occurs within a greenhouse. Carbon dioxide has been labeled as a greenhouse gas along with other molecules that have a similar effect on the atmosphere. These greenhouse gases have been identified as the primary agents causing climate change, the effects of which include an increase in atmospheric temperatures, increased severe storms and droughts, and other similar changes—all of which can have severe impacts on humans and human settlement patterns. For this reason, there is increasing pressure on emitters of carbon dioxide to take steps to reduce carbon dioxide emissions. There are three ways to reduce carbon dioxide emissions to become “carbon neutral.” An emitter can (1) avoid, (2) minimize and/or (3) capture or remove emissions. To avoid emissions, users will pursue sources of energy that involve no direct emissions such as solar or wind. To minimize emissions, users will become more efficient through better insulation and design, through low emission vehicles or by purchasing energy star appliances, for example. For those carbon emissions that remain after avoidance and minimization, the only path remaining to carbon neutrality is by removing and storing carbon dioxide emissions. And here, the only proven technology that is scalable and relatively inexpensive is soil or biological storage. If you are a hydrocarbon supplier or refiner, carbon storage likely is the only way to neutralize the impact of your operations on the Earth’s climate, an issue that is becoming more pressing each year. Pressure is mounting upon the oil and gas community to undertake action to reduce carbon dioxide emissions and/or their impact on atmospheric CO2 levels. Last week, the maritime industry identified that it would become carbon neutral, representing three percent of global carbon emissions. Volvo recently announced it would manufacture only electric and hybrid vehicles starting in 2019. Monsanto has announced plans to become carbon neutral as have several cities and the province of British Columbia. Every major corporation in the world has calculated its carbon footprint. They’ve yet decided what actions, specifically, to do in order to achieve their footprint. The SSPEED Center research has determined that the carbon footprint of a 150,000-barrel-per- day refinery could be sequestered for the company and their customers by sequestering about four to five million tons of carbon (or about 25 to 30 million tons of carbon dioxide). At four to five tons of CO2 per acre (an ambitious goal), this footprint could be sequestered on about five to six million acres. A car company might purchase in advance the carbon footprint of an internal combustion vehicle, allowing it to offer carbon neutral driving. Consumers will demand these options in the future. Landowners who restore or use native ecosystems or grasslands are already storing carbon in their land. Until a carbon “baseline” is established by testing, however, it’s impossible to know how much carbon dioxide is being removed from the atmosphere by a particular piece of property. 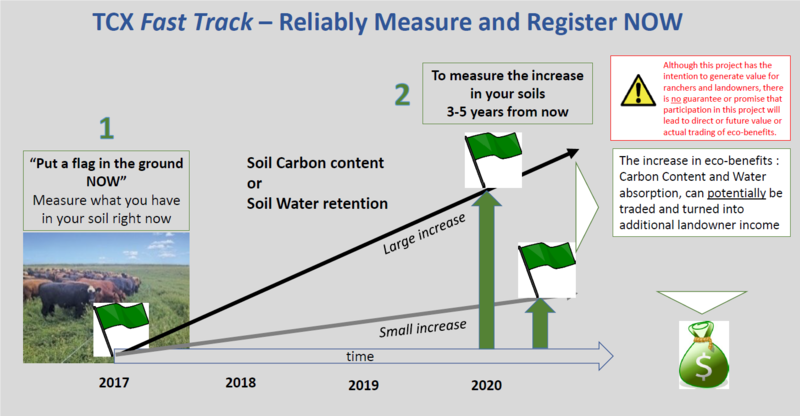 Once that baseline is set, then a second test can be conducted after a few years to determine the amount of carbon dioxide removed from the atmosphere and stored in the soil as soil carbon. The measured increase in carbon storage in the soil can then become a saleable commodity on the Texas Coastal Exchange (TCX). An illustration of this concept is set out in Figure 2. Figure 2. Illustration of the basic concept of testing to initiate ecosystem service measurement. Note that no carbon transactions can occur without baseline and subsequent testing. In the view of the project team, carbon dioxide sequestration is just like growing potatoes. You undertake certain action, bear the fruits of that labor, and then sell it. Currently, there is a modest voluntary market for the purchase of carbon dioxide storage capacity. As more and more corporations, institutions and individuals move toward carbon neutrality, however, the demand will increase. Calculations reviewed by the SSPEED Center team reveal that there is unlikely to be sufficient capacity in the soil or biomass for all existing, much less future, carbon dioxide emissions each year. In other words, there may not be sufficient capacity in the world to remove all of our excess carbon dioxide from the atmosphere. For this reason, the modest carbon dioxide market of today is expected to become more and more robust if not explosive in the not-too-distant future. This is why carbon dioxide storage in the soil will be the initial focus of the TCX; the exchange, however, will also be used for flood abatement, water supply enhancement and more general ecological service value transactions. The intent of the SSPEED Center in creating the Texas Coastal Exchange was to enhance the economic viability of the Texas coastal agricultural community and maintain agricultural and ranching activities and culture. For this reason, the standards of the TCX have been tailored to support economic development as well as to achieve ecological and social goals. Initially, TCX has focused upon carbon transactions although other transactions may be implemented as well. A typical carbon trading system is set out in Figure 3. Figure 3. 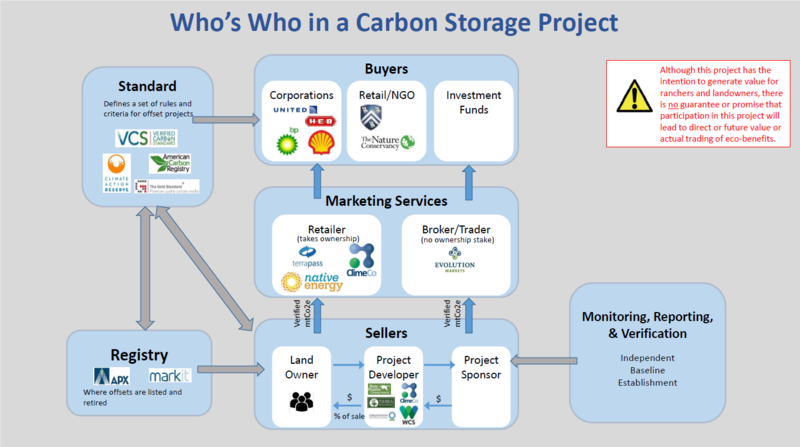 Diagram showing the various participants in carbon transactions. Both buyers and sellers must agree upon a standard and the standard must have a relationship with a registry. As shown in Figure 3, there are several interrelated pieces in a typical carbon transaction. The system is bracketed by buyers and sellers. Both must exist. Often, there is a marketer between the buyer and seller, although that is not always the case. The standard setting organization is absolutely essential in that the rules and standards set by this organization define the requirements for participation under that standard. Both the buyer and seller must agree and be comfortable with a standard or else no transaction will occur. All commodities traded must be registered to obtain unique identification numbers to eliminate fraudulent sales. And there is a necessity for monitoring, verification and validation procedures to ensure rules and standards are being applied and that the transactional value and integrity is maintained. Editor's note: Click here to read part one of this three-part series that introduces The Texas Coastal Exchange (TCX), a trading clearinghouse involving the sale of ecological services. Jim Blackburn is an environmental lawyer and planner, co-director of the SSPEED Center at Rice University, Professor in the Practice of Environmental Law in the Civil and Environmental Engineering Department at Rice and author of A Texan Plan for the Texas Coast, forthcoming, November 2017, Texas A&M University Press. Dr. Henk Mooiweer has his doctorate in chemistry and is a specialist in creativity and innovation in his private company, Innovenate, and in his role as adjunct Professor at Rice University. He is formerly with the Gamechanger Program among several other positions with Royal Dutch Shell. Megan Parks is a Principal with AMB Parks Consulting, where her practice focuses on innovative compliance efforts, biomimicry and ecological valuation strategies. She previously worked for over 15 years with BP Corporation, including work on the Deepwater Horizon spill. Megan holds a B.S. in Chemical Engineering and an M.S. in Environmental Engineering.